The Journal aim is to satisfy the goal of ensuring rapid and wide dissemination of results of scientific researches that could finally trigger the advancement of human kind in all its ramifications. The Journal’s scope is wide in that it reported findings in the areas of pure and applied sciences, namely; Agricultural Sciences, Botany, Biochemistry, Chemistry, Computer Science, Engineering, Environmental Sciences and Geography. 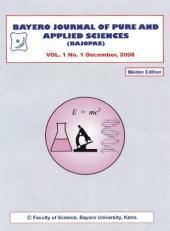 Also, areas of Laboratory Science, Technology, Mathematical Sciences, Microbiology, Physics, Medical Sciences and Zoology form part of the contents of the Journal. Scientists in the academia, research institutes and industries are therefore encouraged to participate actively in the propagation of their works through Bayero Journal of Pure and Applied Sciences (BAJOPAS).